Picking out just 10 favorite Mediterranean ports is like choosing only a pound of chocolates at See’s Candies. They’re all so marvelous, orange cream and Marseilles excluded. We’ve covered Rome, Athens, Naples, Barcelona, Florence and Santorini, in that order, and now it’s time to round things out. So, without further ado, here’s Nos. 6-10 as discovered during back-to-back 10-day Mediterranean cruises aboard the resplendent Celebrity Reflection and remarkable Carnival Vista. What does the Grecian port of Rhodes have in common with Disneyland? Walk off the ship or through the turnstile and in 5 minutes you can enter a castle-like fortress where fun, food and souvenirs await. Just don’t expect to see Mickey Mouse in Rhodes – hungry feral cats abound within the 2 1/2 miles of 40-foot-thick medieval walls. Look passed the cafes serving pizza and spas where “doctor fish” nibble on the dead skin of tourists’ feet, and Rhodes’ Old Town resembles a bona fide Turkish bazaar – and for good reason: Turkey is just 11 miles away and bound by 300 years of influence. Exploring Old Town can easily be done on your own and minutes off the boat, but getting to the second-most visited attraction in Rhodes – the beautiful, yet tourist-jammed ancient city of Lindos – requires ample time and wheels since the 35-mile trek each way takes about 45 minutes, longer during peak season that runs April through September. Crowds will also have you deciding whether the Acropolis, site of a temple to the goddess Athena, is worth hiking up a narrow and sometimes thronged and treacherous path. Donkeys can carry you up in exchange for 5 euros and your PETA membership card. Rhodes is known for its collection of stunning beaches and shapely sun worshippers, so if taking a dip in hot Greece sounds good, avoid built-up Faliraki Beach if you have the time to go farther south to a less-congested shore. Located halfway between the ship and Lindos is Tsambika Beach, which has just enough tavernas serving grub and grog, free Wi-Fi, and lounge chairs, umbrellas and aquatic equipment for rent. The southern end is more serene and where nudists laugh in the face of melanoma. If visiting Tsambika Beach, Lindos and Old Town sounds like a perfect day, which it was on my return trip there, do it in that order so you’re among the first ones at the ocean, and book a private driver before leaving home. 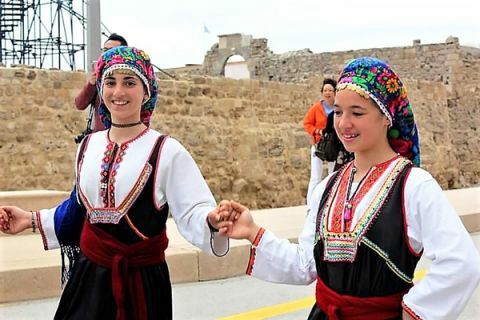 Highly recommended is Taxi Rhodes, which charged 180 euros for 6 hours that began at 9 a.m. sharp dockside and ended with a sas efcharistó and antio – thank you and goodbye – just outside Old Town where we took it from there. Manolis Kiaourtzis couldn’t have been a better and more intuitive driver, guide and representative of this top Mediterranean port. One could easily spend the entire day within walking distance of the ship in Kusadasi, Turkey. The port’s vibrant and secure shopping center and adjacent retailers are chockablock with such local specialties as carpets, silk pashmina and ceramics. If you’re ever tempted to skip a pre-paid lunch on the ship, this is the place. It’s hard to beat hospitable Guverte Restaurant for seafood (try the grouper), coffee (Turkish, of course) and Facebook-worthy photos of your floating hotel from across the marina. But let’s talk Turkey: Cruise ships don’t call on Kusadasi because of what’s in and around the port. The emphasis here is Ephesus. Once home to philosophers, gladiators and rulers, the ancient city is rich in ruinous architecture and history, and a fleet of buses parked on the other side of the gangway can take you there in 30 minutes. 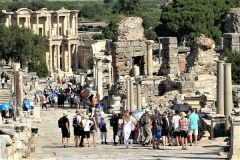 Nearly every shore excursion offered through the cruise lines includes a visit to what’s considered one of the world’s most magnificent and best-preserved archaeological sites. There’s usually a no-frills 3 1/2-hour-long tour to appease your inner Clark Griswold (think Grand Canyon), and a few with durations of over 8 hours for those wishing to immerse themselves in the Greek Dark Ages to Late Middle Ages of 10th century BC to 15th century AD. Longer tours often include a visit to the House of the Virgin Mary, where the blessed mother of Jesus is reputed to have spent her final years of life. The less devout and gullible will likely deem this add-on a tourist trap. Cynics also may be turned off to the obligatory carpet demonstration that’s usually tacked onto a ship-booked tour. But don’t make a dash for the exit too quickly; learning about traditional hand-made rugs is actually pretty cool if you ignore the high-pressure sales tactics. If nothing else, enjoy the free apple tea. A dearth of shore excursion options is actually part of the allure of this Greek island, a destination Lonely Planet keenly observed as one that “flaunts its sizzling St. Tropez-meets-Ibiza style and party-hard reputation.” Any nightlife will have begun long after it’s anchors aweigh for you since larger cruise ships are gone by sundown, but a hip vibe permeates even in daytime, as does traditional Greek charm. 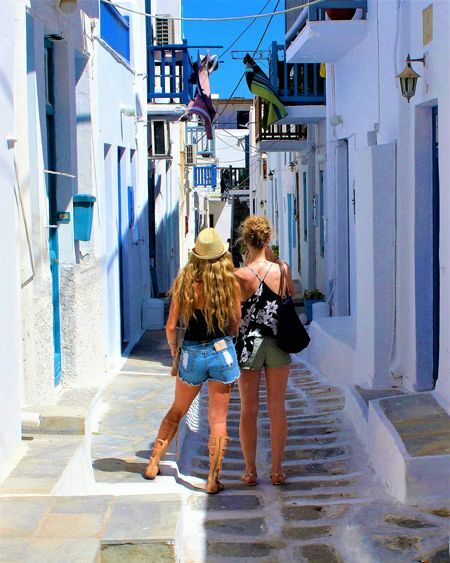 Tours of ancient Delos, birthplace of the god Apollo, and shuttles to wonderful beaches get some takers, but most visitors who get off the boat hoof it to Old Town to stroll the narrow streets that lead to boutiques, museums, cafes, pastry shops, churches and a few surprises. Many get flat-out lost thanks to a centuries-old defense scheme designed to thwart would-be invaders. The town is plotted as a maze, and a total whitewash of its buildings plus a street system that would delight Sarah Winchester make navigation challenging even for tourists with GPS. Not to worry – the Aegean Sea or a friendly local will stop you from going too astray. First impressions of Crete being a loser port are understandable, especially if judging by high Mediterranean standards. Heck, even the cruise lines’ list of shore excursions is mediocre for a place where Hercules once roamed. To this point, the “Best of Crete” tour is highlighted by a visit to the Palace of Knossos that disappoints for being overly restored and lacking in original antiquities. But give the home to Europe’s earliest civilization a chance, because the ho-hum-sounding tours give you a rare, stress-free opportunity to assimilate with the locals. There’s no easier, cheaper or quicker way to do that than taking the hop-on hop-off open-top busses of Heraklion Sightseeing Tours. 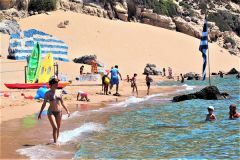 For just 20 euros (15 if you buy online in advance or cut a deal with the ticket seller), you’re taken on a loop around Crete’s capital and Greece’s fourth-largest city. Any of the 11 stops is a starting and ending point, technically, but the official one is just off the ship. After quick stops by a medieval fortress and a small, but decent aquarium, consider getting off to truly soak up indigenous culture and color. Pop in a grocery store, where the most unusual items are often in the produce and meat sections. Check out the butcher’s skinned rabbit destined for a Greek stew called stifado. Like dinner, if you’re not in a hopping mood simply stay on the bus and enjoy the multilingual recorded narration uninterrupted; you’ll be back to the ship in an hour.